This morning, May 25, AUKLET made it out of the boat shed, down the road, and into the water, after about a year and a half on dry ground. We’ve had a very late spring here, which put a hitch in my grand ideas of launching in late April or early May. Finally the leaves are starting to come out on the trees – if only barely, in these photos – and we had enough warmer weather for necessary projects. Here’s the boat ready to go at our nearby ramp in Steuben. 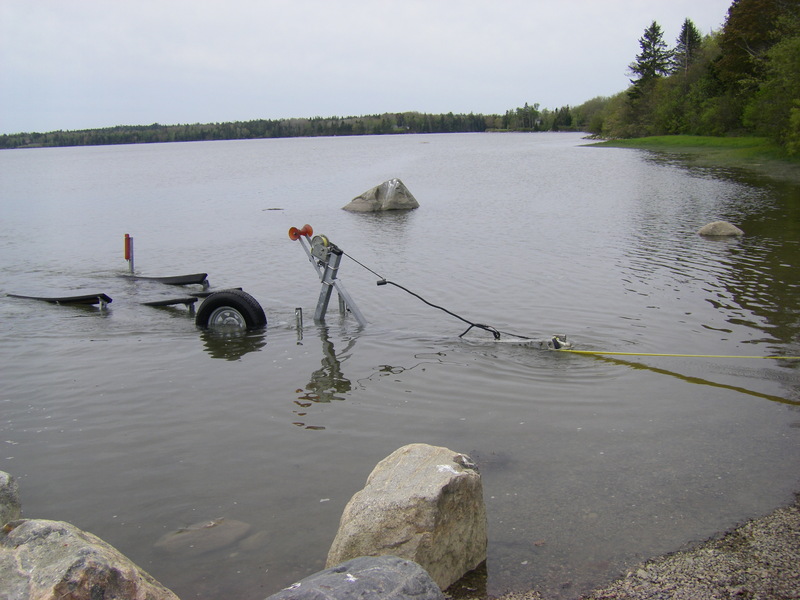 This ramp is gently sloping, so even with the hitch extension on the trailer, there is no floating the boat without letting the trailer farther into the water. This involves a webbing strap, and trusting the tongue jack with the little wheel in front to carry the forward end of the trailer and boat. One of our projects this spring was adding a new tongue jack with double wheels, because the old one has been looking precarious. The new one fit nicely on the other side of the trailer, so now we have two. Redundancy is good, and overall, especially because of the A-frame layout of this trailer, the arrangement seems sturdier and better balanced than even a single jack that’s in good condition. We used both, for the launch. In this picture you can see their vertical tubes on each side of the winch post. Of course, that photo was jumping ahead. 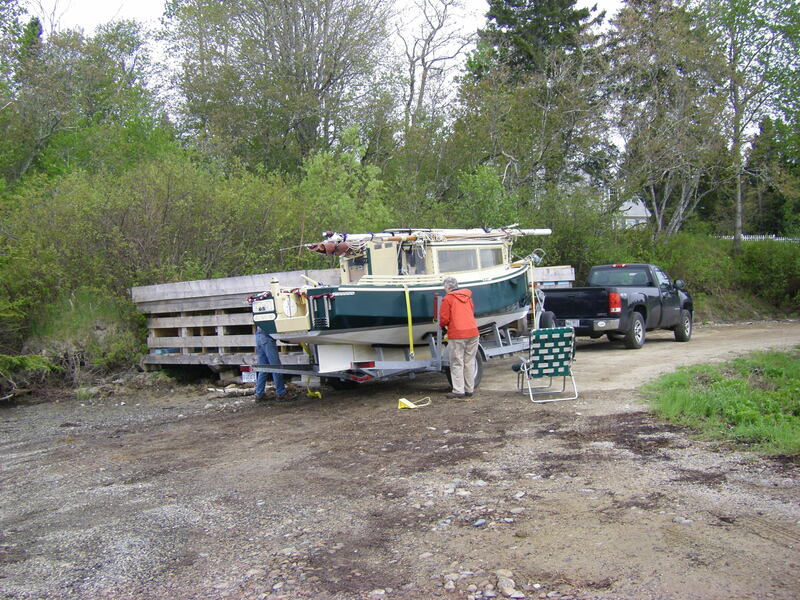 The first order of business, after the masts were in place, was backing the trailer to the edge of the water, chocking, disconnecting the trailer from the truck, extending the hitch, and attaching a long heavy-gauge webbing strap to the trailer hitch at one end, and to the truck hitch at the other. There was a moment of drama when one of the chocks slid on the slippery ramp, and the whole business, trailer and boat, readjusted itself by about a foot on one side. After the chock on that side was pushed firmly back in place we were once again in business, with no further slipping. Then the truck pulled forward to stretch out the webbing, and put on enough strain to release the chocks from behind the trailer. 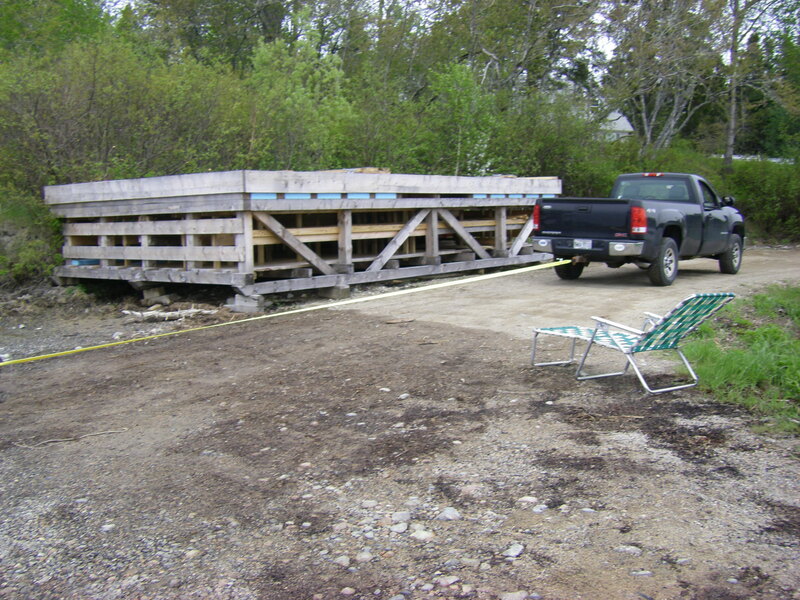 Chocks were retrieved, and then the truck backed up, letting the trailer roll slowly into the water. With the truck a respectable distance from the edge of the water, the boat was floating but not yet free. The tide was rising and shortly did the rest of the work. Friends who had come in a skiff for the festivities (thank you Chubba and Arthur!) took a stern line and easily guided the boat off of the trailer. We had dispensed with the electric motor for this effort. It’s a project to get the sails rigged, in a junk rig. 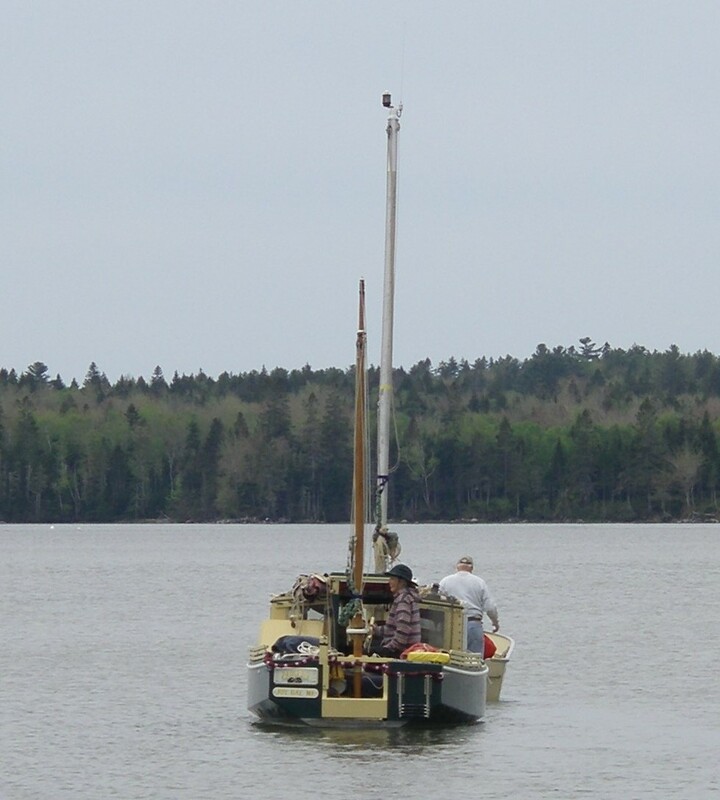 Without the sails, in a wind with some rockweed snagged in the propeller the motor offers a false sense of possibility; last year with the Peep Hen this approach led to emergency anchoring and rigging the much simpler gaff rig to then sail back to our float. The little Torqeedo would have managed on this much calmer day, but only if the forecast wind did not come up before we were finished. We decided to skip that particular set of stresses. With AUKLET and no motor, the options are either rig the boat on dry land after the masts are up (fussy and time consuming, with launch-helpers waiting); launch and anchor near the ramp (might or might not find that one very small perfect spot where the boat will actually float at low tide, rather than uncomfortably going over on its side), and stay for the night (cold, rainy storm coming); yuloh across to the mooring or float, about a mile away (gotta already be in shape, for that one, and like the electric motor, not feasible at all if the breeze comes up); or, ding ding ding! have a wonderful friend with a skiff and a sturdy gasoline outboard. 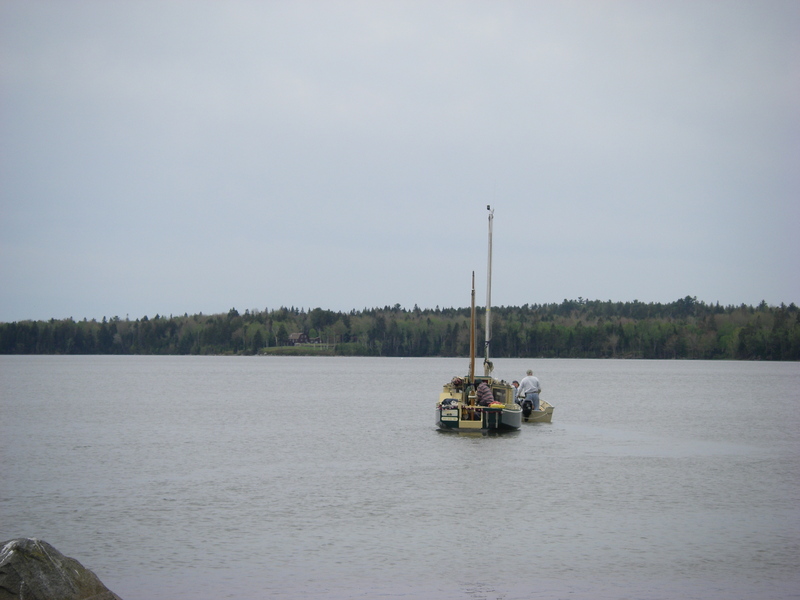 The original plan was to tow AUKLET to our float, and let the boat go up and down on the mud while we took our time with rigging. The weather had other ideas, with the storm coming in tonight and tomorrow that will blow directly across Joy Bay, pushing waves into the float on our side of the bay. The steady 20 to 25 knots that is forecast is enough for some pretty good whitecaps, which would not be kind to the boat in the transition between floating and being high and dry. So now AUKLET is out on the mooring, perfectly snug for the messy weather. 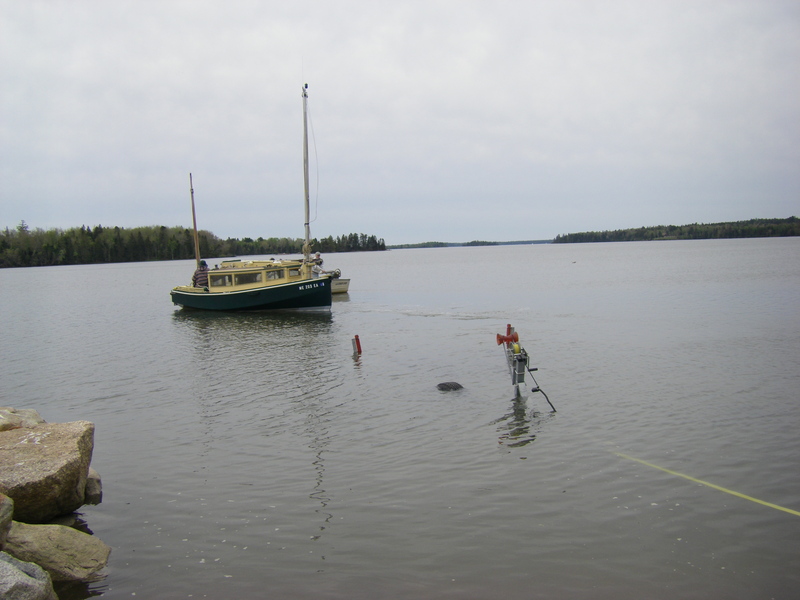 We had a nice tow from the ramp to the mooring, and then the boat was on its own as I got a ride in to shore. Bonus, all those friendly helpers put MARIGOLD (the Portland Pudgy dinghy) in the water too, making quick work of what would have been a little more tricky sliding over the rocks. Those three strong folks picked that boat up like it was groceries! What a wonder. This morning we went from no boats in the water, to two, just like that, and back in the house before lunchtime. In a couple of days the weather will clear up; if all goes well we’ll have some fun with rigging, and after a little more loading of supplies the boat will be ready to go. Many thanks to Chubba, Arthur, Chipper and Suzanne, who all made this possible. And to Joy Bay, for being there. Hooray! Looking forward to upcoming editions of “Sailing Auklet”! Which will include trips headed for Swans Island, no doubt! Kent and I will be looking forward to it. Congratulations on the launch! I raise an invisible glass to a summer of great adventures. Sailing alongside REVEILLE will be such fun – I’m looking forward to it! I do indeed hope to come down your way. Looking forward to it! 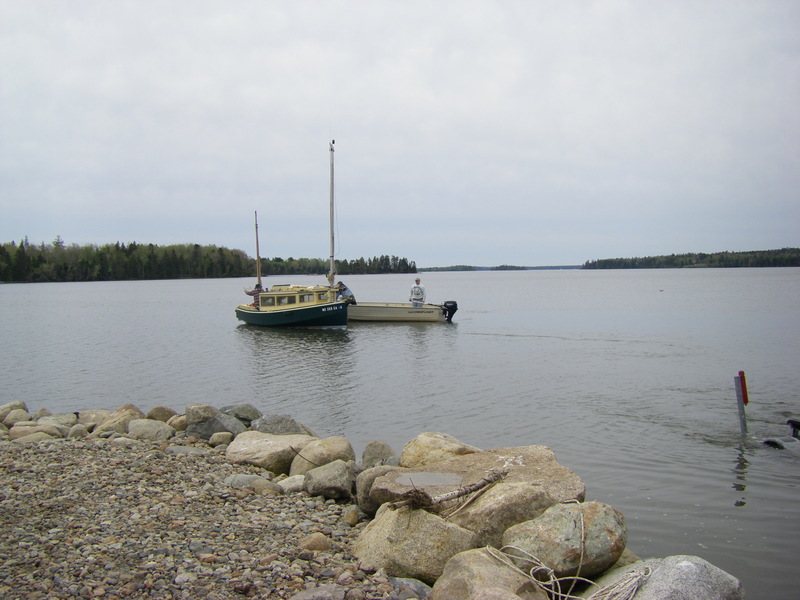 Finally launching your boat near your new Maine home. Have a wonderful summer! So glad to hear that you (i.e., Auklet) are once again afloat. I’ll look forward to more of your always instructive (and now motorless) adventures. “Motorless” has been making it interesting already. Sure does make it easier to bring a dinghy up to that easy step in the stern!